Just when you think you have seen or heard of every style and design of toilet along comes one more. 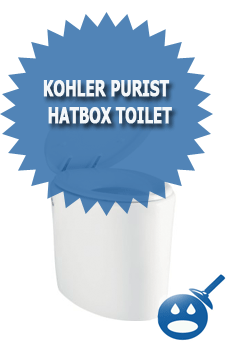 Kohler is one of the top three plumbing fixture company in the world has come up with the Kohler Purist Hatbox Toilet. This style and design is unlike any that you have seen before. Kohler has been providing homeowners some great designs and styles in all of their plumbing fixtures since 1873. They have one piece, two-piece toilets as well as other great plumbing fixtures. 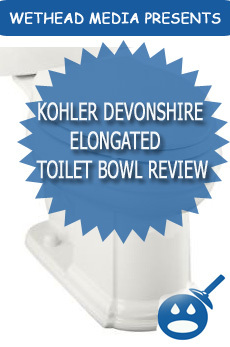 Kohler is a name you can trust and rely on. Kohler stands by all of their products and that is why they are the leaders in design, craftsmanship and originality. Let’s take a look at the Kohler Purist Hatbox Toilet has to offer in specifications and design. The Kohler Purist Hatbox Toilet or K-3492 comes with Quiet Close Toilet Seat and Cover. This style and design is very unique, it measures in 24-5/8 inches in length x 16-1/2 inches in width x 16-5/8 inches in height. The Kohler Purist Hatbox Toilet has a smooth soft touch actuator. It is made from a durable Vitreous China, making this toilet last for many years to come. This is a one-piece toilet and it doesn’t come with the supply. The Kohler Purist Hatbox Toilet comes with an elongated bowl for better comfort. This toilet comes with the Kohler Power Lite System. This system is requires a dedicated circuit. It has to have a protected Class A Ground Fault Circuit Interrupter. It uses a 120 vac with 15 amps and 60 Hz. You will find that this toilet has a 16-5/8 inch high bowl with seat and a 12″ rough in. This toilet is considered to be a low water consumption toilet with gallons per flush of 1.6. Since the Kohler Purist Hatbox Toilet has a 1.6 gallons per flush, you can save water on a yearly basis. The Hatbox Toilet is very easy to take care of. You should never use any type of cleaner that has an abrasive ingredient, you could scratch the toilet. The care of the Kohler Purist Hatbox is easy, using a mild cleanser; spray on and wipe don’t allow the cleaner to soak on the toilet. Do not use an abrasive brushes or scouring pads to clean the Hatbox Toilet. Installation of the Hatbox can be done by the homeowner. You will need an adjustable wrench, a tape measure, masking tape, wax seal, T Bolts, knife, supply stops and assorted screwdrivers. It is very important to read the installation manual very carefully and if you are not sure about doing the install, ask a friend or perhaps a professional installer. The Kohler Purist Hatbox meets or exceeds the ASME A112.19.2, the Energy Policy Act of 1992 and the Underwriter’s Laboratories. All Kohler Toilets are made to last and they have strong components. The warranty on this toilet is a one-year limited warranty. To find out all about the warranty for your Purist Hatbox, check out the warranty information on the Kohler website.Kohler has hundreds of different styles and series of plumbing fixtures. If you are looking for a different style of toilet, something to really set your bathroom apart from friends and family then the Purist Hatbox Toilet from Kohler is a great choice. The price of the Kohler Purist Hatbox starts at $4,059.95 and is available in white. Check out the Kohler website to learn more.